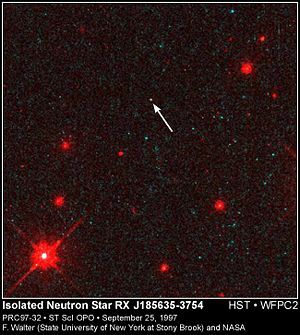 The first neutron star to be directly observed in visible light was RX J185635-3754. A neutron star is an extremely dense, compact star with an interior that is thought to be composed of mainly neutrons. It is formed from the collapsed remnant of a massive star during a supernova explosion, and it represents one of the few possible end-points of stellar evolution. A highly magnetized, rapidly rotating neutron star that emits radio waves is called a pulsar. A typical neutron star has a mass between 1.35 and 2.1 solar masses, with a corresponding radius between 10 and 20 km—about 30,000 to 70,000 times smaller than the Sun. Thus the density of a neutron star (estimated at 8×1013 to 2×1015 g/cm³) is close to that of an atomic nucleus. In 1932, Sir James Chadwick discovered the neutron as an elementary particle. For that discovery, he was awarded the Nobel Prize in Physics in 1935. In 1933, only a year after Chadwick's discovery, Walter Baade and Fritz Zwicky proposed the existence of the neutron star. In seeking an explanation for the origin of a supernova, they proposed that the neutron star is formed in a supernova. Supernovae are dying stars that suddenly appear in the sky, with such strong luminosity (in the optical range) that they might outshine an entire galaxy for days to weeks. Baade and Zwicky proposed that the release of the gravitational binding energy of the neutron stars powers the supernova: "In the supernova process, mass in bulk is annihilated." If the central part of a massive star before its collapse contains (for example) three solar masses, then a neutron star of two solar masses can be formed. The binding energy E of such a neutron star, when expressed in mass units (via the mass-energy equivalence formula E = mc²) is one solar mass. It is ultimately this energy that powers the supernova. In 1965, Antony Hewish and Samuel Okoye discovered "an unusual source of high radio brightness temperature in the Crab Nebula.” This source turned out to be the Crab Nebula neutron star that resulted from the great supernova of 1054 C.E. In 1967, Jocelyn Bell and Antony Hewish discovered regular radio pulses from the location of the Hewish and Okoye radio source. This pulsar was later interpreted as originating from an isolated, rotating neutron star. The energy source of the pulsar is the rotational energy of the neutron star. Most known neutron stars are of this type. In 1971, Riccardo Giacconi, Herbert Gursky, Ed Kellogg, R. Levinson, E. Schreier, and H. Tananbaum discovered 4.8-second pulsations in an X-ray source in the constellation Centaurus, Cen X-3. They interpreted this as resulting from a rotating, hot neutron star. The energy source is gravitational and results from a rain of gas falling onto the surface of the neutron star from a companion star or the interstellar medium. In 1974, Antony Hewish was awarded the Nobel Prize in Physics "for his decisive role in the discovery of pulsars." When a massive star (with a mass 4-8 times that of the Sun) has burned practically all of its nuclear fuel, it may explode to form a supernova. The star's outer layers are blown away, leaving behind a "supernova remnant." The star's central region (core) collapses so strongly under gravity that protons and electrons bind together to form neutrons. This is why the star is called a "neutron star". A neutron star retains most of its angular momentum. Since it has only a tiny fraction of its parent's radius (and therefore its moment of inertia is sharply reduced), a neutron star is formed with very high rotation speed and then gradually slows down. Neutron stars are known to have rotation periods between about 1.4 milliseconds (ms) to 30 seconds (s). 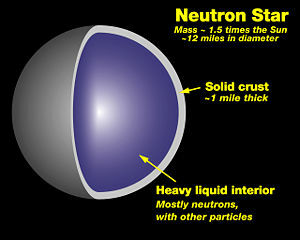 The neutron star's compactness also gives it very high surface gravity, 2×1011 to 3×1012 times stronger than that of Earth. One measure of such immense gravity is that neutron stars have an escape velocity of around 150,000 km/s, or about 50 percent of the speed of light. Thus, matter falling onto the surface of a neutron star would strike the star at 150,000km/s, in which case it is expected to be crushed under its own weight into a puddle less than an atom thick. A model of a neutron star's internal structure. Current understanding of the structure of neutron stars is defined by existing mathematical models. A neutron star is so dense that one teaspoon of its material would weigh 100 million metric tons (100 Gg, 100×109 kg). On the basis of current models, the matter at the surface of a neutron star is composed of ordinary atomic nuclei and electrons. The "atmosphere" of the star is roughly one meter thick, below which one encounters a solid "crust." Proceeding inward, one encounters nuclei with ever-increasing numbers of neutrons; such nuclei would quickly decay on Earth but are kept stable by tremendous pressures. Proceeding deeper, one comes to a point called neutron drip, where free neutrons leak out of nuclei. In this region, there are nuclei, free electrons, and free neutrons. The nuclei become smaller and smaller until the core is reached—by definition, the point where they disappear altogether. So far, however, observations have neither indicated nor ruled out such exotic states of matter. A neutron star has some of the properties of an atomic nucleus, including its density and its content of nucleons. In popular scientific writing, neutron stars are therefore sometimes described as giant nuclei. However, neutron stars and atomic nuclei are quite different in other respects. In particular, a nucleus is held together by the strong force, while a neutron star is held together by gravity. It is generally more useful to consider such objects as stars. Neutron stars rotate extremely rapidly after their creation, due to the conservation of angular momentum. Like the increasing speed of an ice skater pulling in his or her arms, the slow rotation of the original star's core speeds up as it shrinks. A newborn neutron star can rotate several times a second. Sometimes, when orbiting a companion star and accreting matter from it, the neutron star can increase this speed to several hundred times per second, distorting into an oblate spheroid shape (an equatorial bulge) despite its own immense gravity. Over time, neutron stars slow down because their rotating magnetic fields radiate energy. Older neutron stars may take several seconds for each revolution. The rate at which a neutron star slows down its rotation is usually constant and very small. The observed rates are between 10-10 and 10-21 second for each rotation. In other words, for a typical slow-down rate of 10-15 seconds per rotation, a neutron star currently rotating once in one second will rotate once in 1.000003 seconds after a century, or once in 1.03 seconds after one million years. Sometimes, a neutron star will spin up or undergo a glitch, a rapid and unexpected increase of its rotation speed (of the same, extremely small scale as the constant slowing down). Glitches are thought to be the effect of a "starquake": As the rotation of the star slows down, the shape becomes more spherical. Due to the stiffness of the 'neutron' crust, this happens as discrete events during crust rupture, similar to tectonic earthquakes. After the starquake, the star will have a smaller equatorial radius, and (because angular momentum is conserved) rotational speed increases. Neutron stars may "pulse" due to particle acceleration near the magnetic poles, which are not aligned with the rotation axis of the star. Through mechanisms not yet entirely understood, these particles produce coherent beams of radio emission. External viewers see these beams as pulses of radiation whenever the magnetic pole sweeps past the line of sight. The pulses come at the same rate as the rotation of the neutron star and thus appear periodic. Thus the name "pulsar" is given to a neutron star that emits such pulses. The most rapidly rotating neutron star currently known, PSR J1748-2446C.E., rotates at 716 revolutions per second. A recent paper reported the detection of an X-ray burst oscillation (an indirect measure of spin) at 1122 Hz from the neutron star XTE J1739-285. However, this signal has been seen only once so far, and should be regarded as tentative until confirmed by another burst from this star. Single pulsars – general term for neutron stars that emit directed pulses of radiation towards us at regular intervals (due to their strong magnetic fields). Magnetar – a neutron star with an extremely strong magnetic field (1000 times more than a regular neutron star), and long rotation periods (five to 12 seconds). X-ray burster – a neutron star with a low mass binary companion from which matter is accreted resulting in irregular bursts of energy from the surface of the neutron star. Quark Star – a currently hypothetical type of neutron star composed of quark matter, or strange matter. As of February 2007, there are three candidates. Preon star – a currently hypothetical type of neutron star composed of preon matter. As of 2007, there is no evidence for the existence of preons. ↑ Calculating a Neutron Star's Density NASA. Retrieved June 24, 2008. ↑ In general, compact stars of less than 1.44 solar masses, the Chandrasekhar limit, are white dwarfs; above two to three solar masses (the Tolman-Oppenheimer-Volkoff limit), a Quark star might be created, however this is uncertain. Gravitational collapse will always occur on any star over five solar masses, inevitably producing a black hole. ↑ James Chadwick (1932), On the possible existence of a neutron, Nature 129:312. ↑ Walter Baade and Fritz Zwicky (1933), Supernovae and Cosmic rays, Phys. Rev. 46. ↑ A. Hewish and S. Okoye (1965), Evidence of an unusual source of high radio brightness temperature in the Crab Nebula, Nature 207:59. ↑ Samuel Okoye and Jocelyn Bell, who shared in the discovery, did not receive the award. ↑ Neutron Stars and Pulsars NASA Goddard Space Flight Center. Retrieved June 24, 2008. ↑ Jason W.T. Hessels, et al. (2006), A Radio Pulsar Spinning at 716 Hz Retrieved June 24, 2008. ↑ P. Kaaret, et al. (2007), Evidence of 1122 Hz X-Ray Burst Oscillations from the Neutron Star X-Ray Transient XTE J1739-285 The Astrophysical Journal 657 (2): L97-L100. Retrieved June 24, 2008. Kaaret, P., et al. 2007. Evidence of 1122 Hz X-Ray Burst Oscillations from the Neutron Star X-Ray Transient XTE J1739-285 The Astrophysical Journal 657 (2): L97-L100. Retrieved June 24, 2008. NASA Sees Hidden Structure Of Neutron Star In Starquake SpaceDaily.com. This page was last modified on 16 November 2018, at 16:31.